Devotees seem to be antiscientific. 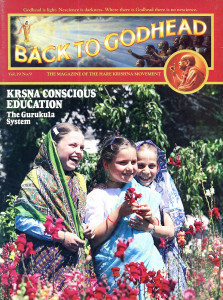 Two articles in the July issue (“Srila Prabhupada Speaks Out” and “Science or Skullduggery?”) are critical of the theory of evolution. And one article in the June issue (“Exploding the Arms Race”) makes fun of the Big Bang theory. Isn’t there any room for science in the realm of Krsna consciousness? We have to tell you how wonderful and uplifting our experience has been at New Vrindaban, where we stayed with our three daughters for five days in June. We had looked forward to this most unique of vacations, and we were amply rewarded. The peace and the pace were both like nowhere in the U.S.A. It was as though it was a piece of Krsna’s land. We felt a oneness with the devotees, although we are still only in the early stages of becoming followers. No doubt with Krsna’s help everything can be done, and you are all living proof of this. . . . We look forward to many years of “happy returns” to New Vrindaban. I really liked the articles on your centers in West Bengal and in Los Angeles. This kind of picture article gives me an idea of how your movement is working around the world . . . even in vastly different settings. Reading these articles is like taking a guided world tour. Can we expect more of these? Our reply: We’re glad you like to see how ISKCON is doing worldwide. You can look forward to an article on our Dallas center in the October issue.